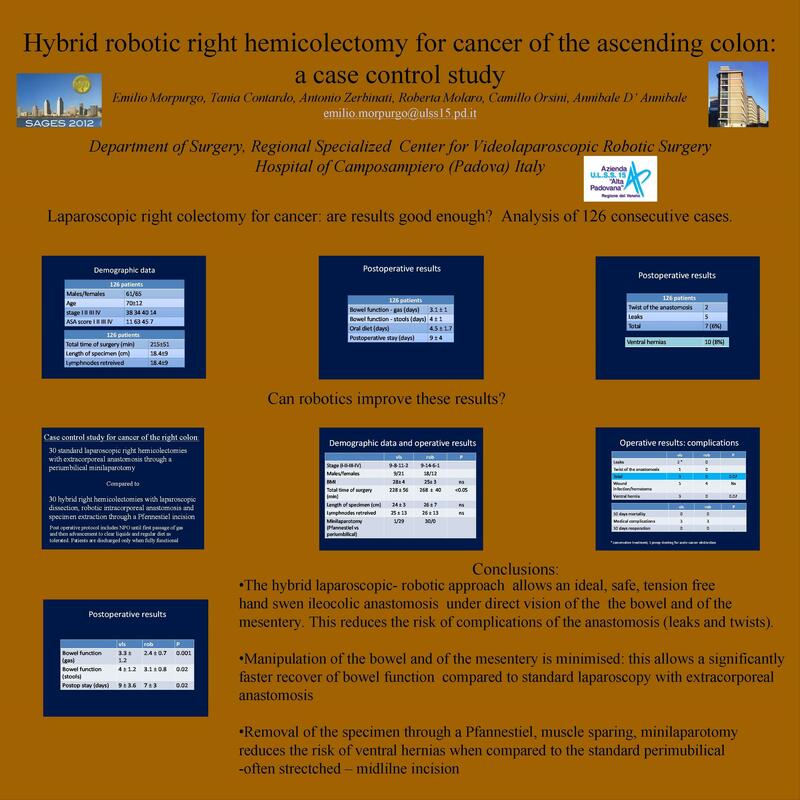 Thirty consecutive right hemicolectomies for cancer (January 2008-june 2011) with laparoscopic medial to lateral dissection, vascular ligation, bowel transection and robotic intracoporeal anastomosis with specimen extraction through a Pfannestiel incision (robotic group-RG) were compared with 30 consecutive laparoscopic hemicolectomies (january 2008-june 2011) with extracorporeal anastomosis and specimen extraction through a periumbilical minilaparotomy (laparoscopic group-LG). Patients were started on oral diet after the first passage of gas and discharged when fully functional. Operative and postoperative results were entered in prospectively maintained data base and analysed using Chi square and t-test when appropriate. The 2 groups were comparable with respect of age, gender, stage of cancer, BMI. Operative time was significantly longer in RG (RG 268±40 vs LG 228±56 min, p<0.05). Length of specimen (RG 26±7, LG 24±3 cm), number of lymphnodes (RG 26±13, LG 25±13) did not differ between the 2 groups. Recover of bowel function (day of first bowel movement: RG: 3±0.8; LG: 4±1.2; p<0.05) and hospital stay (RG: 7±3; LG: 9±3.6; p<0.05) were shorter in RG. There were 3 anastomotic complications (1 twist of the anastomosis, 2 leaks) and 3 ventral hernias in LG and none in the RG (p=0.07).